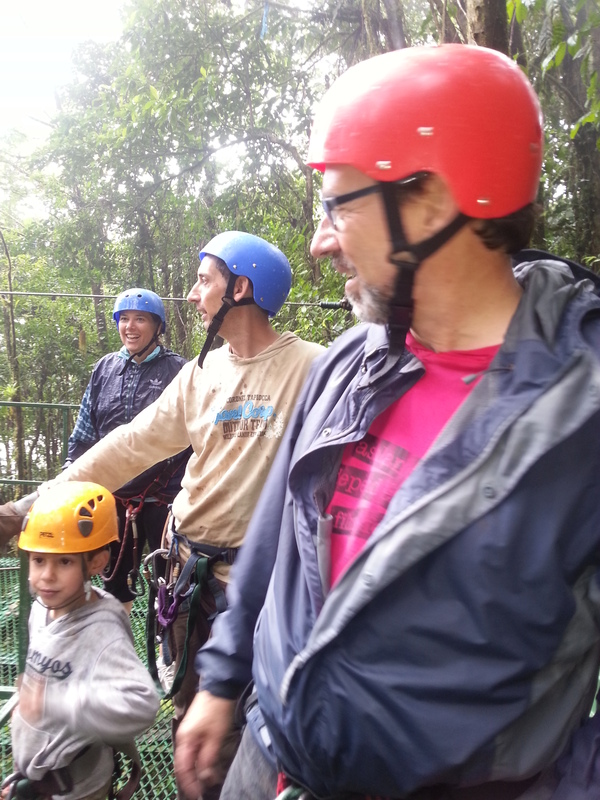 One of the most popular touristy things to do around Monteverde is the zip line “canopy tour” of the rainforest. Many of you readers are probably old hands at the zipline thing, but this was our first time out. I was surprised that our normally cautious Alekka was up for it until I learned that she had mentioned it to her boyfriend , a young man who we believe lacks the fear gene. The BF was so enthusiastic about Alekka’s chance to fly through the rainforest that I think she couldn’t back out. Nothing like a little peer pressure to get you motivated. The reason they call it a canopy tour is that the ziplines are high in the upper canopy of the rainforest. It’s a tour because it’s not just one zipline, but a whole series of them. Our tour, at an establishment called Selvatura Park, consisted of 15 lines covering a total of about 3 kilometers. The last zipline was a kilometer long. This is how it went. They fitted us out with harnesses, helmets, and heavy leather gloves that we wore the whole time. Our group of about ten people got on a van that took us to the starting place in the forest. We walked along a short trail to the first tower where we climbed the metal stairs to a platform. The little guy from Spain was ready for anything. One at a time a guide clipped our harnesses onto the wheel mechanism, then sent us flying along the cable to the next platform, where we were received by another guide. With one hand you hang onto the part of the harness you’re suspended from, and with the other you hold loosely to the cable above you so you don’t spin around. It’s quite fast and a little scary. You slow down naturally toward the end because of the dip of the cable – the lowest point is halfway along, after which your momentum carries you the rest of the way. If you’re going too fast, you can use your hand to put pressure on the cable to reduce speed but you have to be careful not to slow down too much or you’ll stop and get stuck out there – which is somewhat embarrassing. Several of the lines also have a catch near the end that slows you down. After the third or fourth line it’s more fun, when some of the scary wears off. 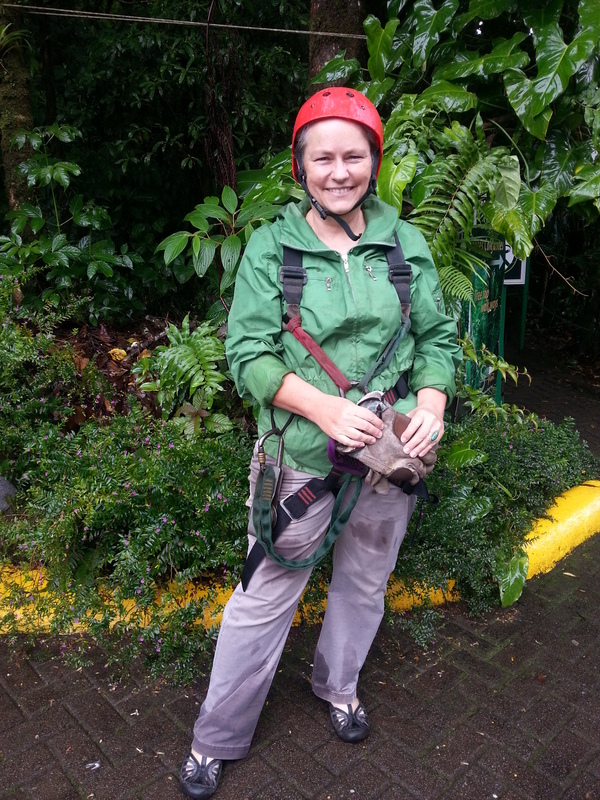 This entry was posted in Elsewhere and tagged Costa Rica, Monteverde, zip line, zipline. Bookmark the permalink.